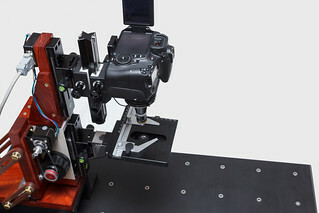 Subject stage mounts on an arca swiss rail. The stage can be centered with a screw on the underside of the bracket (not pictured). I still need to make an illuminator to go under the stage. There is plenty of room to accommodate different designs.